You might recall the Louise Belcher costume I made last year. Well, my obsession with Bob's Burgers (and burgers in general) continues. 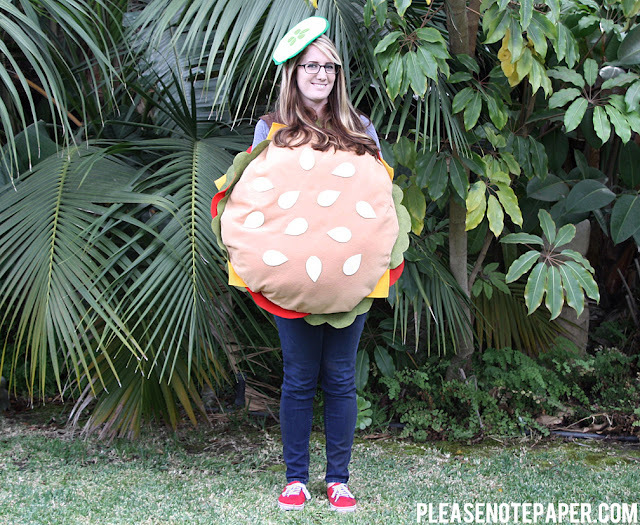 I finished this burger costume (complete with a pickle hat) yesterday and couldn't wait to share it. It's so easy too! I didn't sew a thing! Start by cutting out everything you'll need. I cut 6 large tan circles, white sesame seeds, yellow squares for cheese, red half-circles for tomatoes, and scalloped green shapes for lettuce. Hot glue two of the circles together at the edges (do this twice). Leave a small opening and flip the circles. Now stuff them and glue the opening shut. You should have a top and bottom bun as well as two leftover circles. Glue the sesame seeds onto the top bun. Glue the cheese, tomatoes and lettuce to the back of the top bun. Do the same for the bottom. Now take those two leftover tan circles and glue them to the backs in order to cover the ugly edges of the cheese, tomatoes, and lettuce. Use brown felt to make straps. That's it! I made my pickle hat by sandwiching a piece of cardstock between two green pieces of felt and gluing the entire thing to an elastic headband. Adorable! I'm so impressed that you did this without any sewing too. Thank you! I have the hot glue burns to prove it. Haha! This is so awesome hopefully you still keep this blog and see this but I'm making a burger costume too! 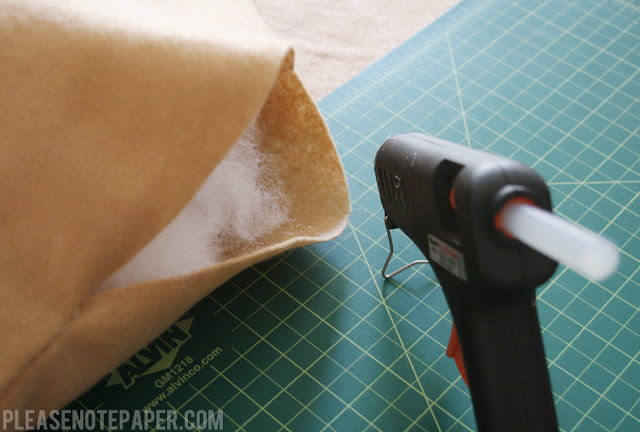 How durable was the glue on the felt? Nice and reliable? :) thank you thank you! Thanks, Katzi! Fionna will be a great costume too! I love this! I do not sew, so I do lots of no-sew crafts. I do but it feels like dragging out my sewing machine and setting it up is half the work. My glue gun is so handy! Thank you! My son just asked me if he could be Beefsquatch (a kid in a hamburger costume with a sasquatch head) for Halloween. Your burger will be perfect! Yesss! Beefsquatch from Bob's Burgers! I love it! Please do! I can't wait to see that! I'm thinking of also making him a pickle hat. He literally doesn't know what to do with himself. I think he thinks its a giant toy. Anyway, thanks for the instructions. This was exactly what I was looking for! It's awesome! I love it! I think I actually glued it and then flipped it inside out. Yours looks great either way though. Thanks so much for sharing! Do you mind if I share that photo on my Please Note Facebook page? Sure! No problem. Thanks again for the tutorial. * if it would be better, I can take a higher quality photo and send it over to you. I feel your pain (literally). It would be awesome sewn too. It will probably last longer! I've been looking at this tutorial for a month or so and finally went to the store to purchase supplies tonight. Everything was very inexpensive. I believe I spent under $20 to make the costume. After about three hours, baboomie! 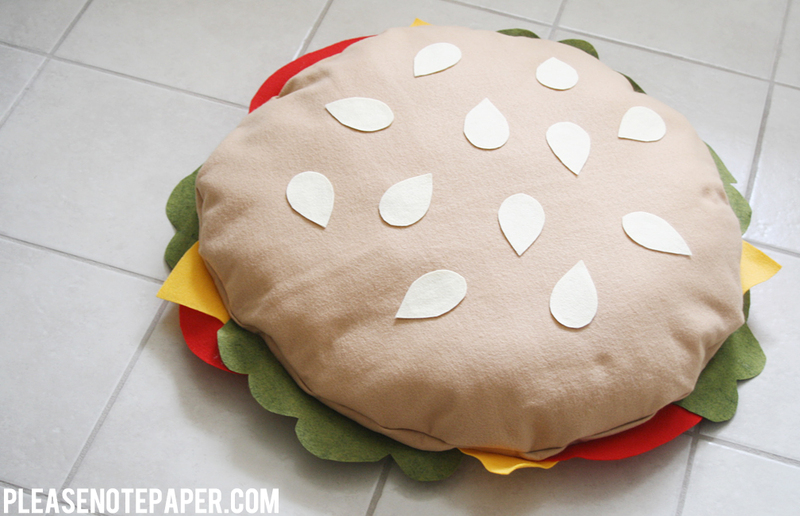 A cute cheeseburger costume! I can't wait to sport it. Thank you very much! How much did this end up costing you to make? 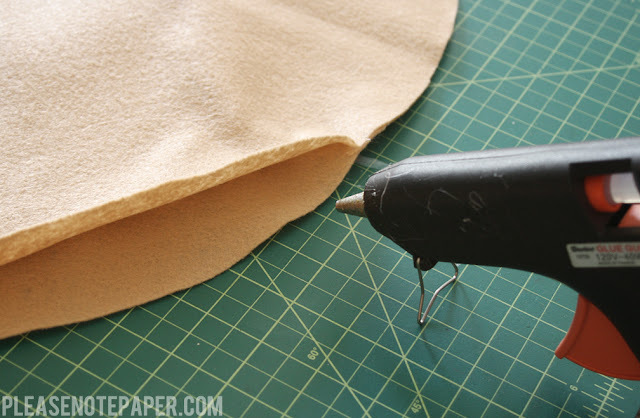 I actually already had a lot of the fabric I needed but if you use the cheapest felt you can find, I'm guessing it will be somewhere around $20. Hi there! 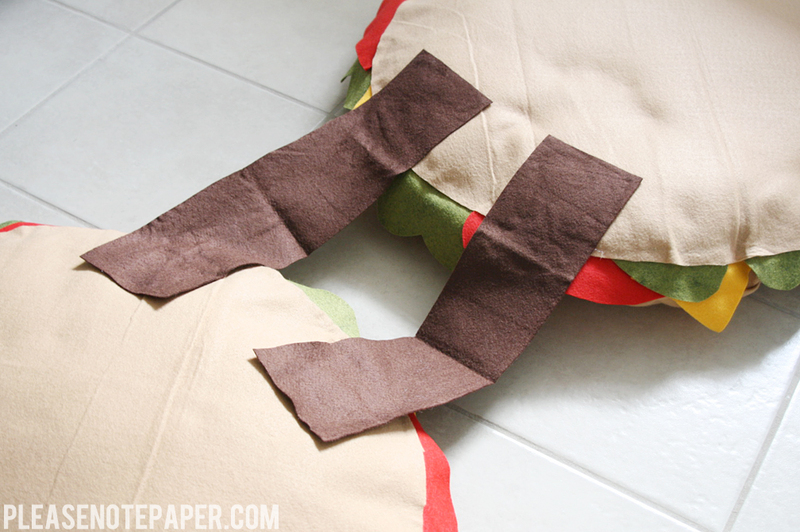 I'm going to make this awesome burger costume this weekend. How big are the circles for the bun? Thank you!! Awesome! I think they are about 2 1/2 ft in diameter. Bursted out laughing. This is just too funny. Very well done!! A burger themed party sounds like my dream come true!! I am absolutely making this for Halloween, thanks! I absolutely love these types of DIY's so make more PLEASE!!! I am always a funny object for Halloween, so make some great DIY's just like this one! In the process of making this. My family is being Bob's Burgers for Halloween. Our 1 year old Daughter will be Louise (im dreading the sewing of the hat...) My wife is Tina (she looks like her already) Brother in Law will be Bob, Sister in Law will be Linda... and I'm being Gene. Gotta be hamburger Gene! I am being the Hamburglar from McDonald's for a Halloween camping trip and I am making this hamburger costume for my fiancé to wear! That will be adorable! I hope you guys have fun! You won't need much at all. You could probably make the burger about 12" in diameter. I think you could get away with 1/2 yd of tan fabric but it helps to see it layed out before you ask them to cut it. Cutest little Gene ever! I'm making this for my 2 year old that is obsessed with bob's burgers and often reminds me of gene! She loves keyboards! I want to make this for my 6 month old. Please let me know how you changed the sizing. Would love to see a picture. Hi, this is great! Excited to make it. Any advice on how to make the circles perfect? I think I flipped a round table and traced it. A hula hoop would work well, too! I'm in the process of making this now for my son! So easy and so much fun! The only part i have to master is how to cut the circles for the buns. I'm making one of these for my boyfriend for Halloween (yay! ), and I'm trying to figure out how much poly-fill I need to buy. That stuff is expensive! Any tips? Thanks! Hi Meghann! One bag goes a long way for me because it's really condensed in there. Also, I don't know if you're near a joanns but I always get mine there and use a clipped coupon (or a coupon on the phone app). Thank you for posting this! I just made an awesome Gene costume for Halloween. This was great!!! You're welcome, Victoria! Sounds like an awesome costume! 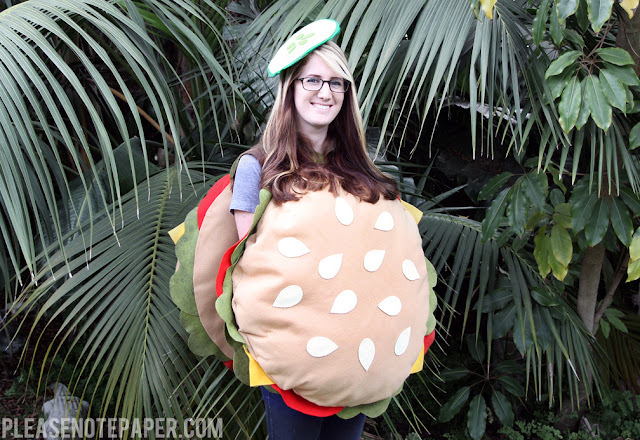 I love this costume but one question...Where is the meat/burger part? I made this costume for my 2 year old and he is the meat! I love it! I just made my costume! thank you so much for posting this!! it literally is my favorite costume ever!!!!! Thank you for sharing this. I made this for my 16-month son. I loves it! 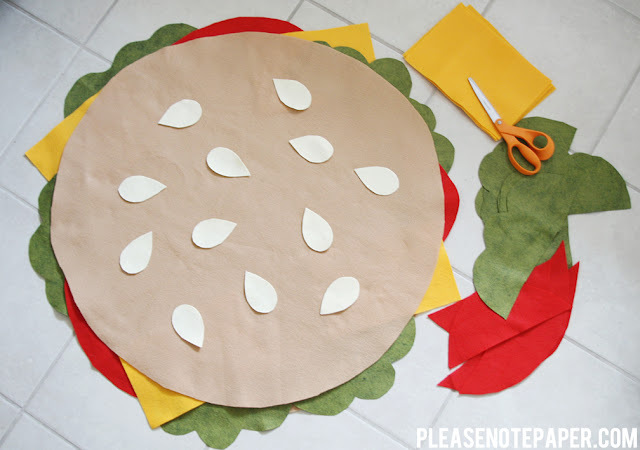 I made a pizza costume with hot glue vs. sewing. I'll make a donut next! Me and my son dressed up as Linda and gene this Halloween. Thank you for this how to! He had so many compliments on his costume. I have a friend that even wants to borrow it next year. Thanks again! Wish I could comment a pic. It was awesome. That's so cute! I've always wanted to be Linda! :) I'm glad the tutorial helped! Hi Kimberly! I just sandwiched a circle of cardboard between two green felt circles, cut out some seeds, and hot glued it all together. Then I glued an elastic headband to the bottom. How big should circles be for a 3 year old? The circles I cut were about 2 1/2 feet in diameter so for a small child, I would probably cut them to be about 1 to 1 1/2 feet. Hello you mention 2 yards of tan felt. But I could only get one side of the hamburger and still need 4 more circles for the other half and inner layer. So in total 6 yards will be needed. Right?? Sorry for the late response! I actually was able to cut 6 tan circles from 2 yards of felt. The felt I used might have been wider than the felt you used.